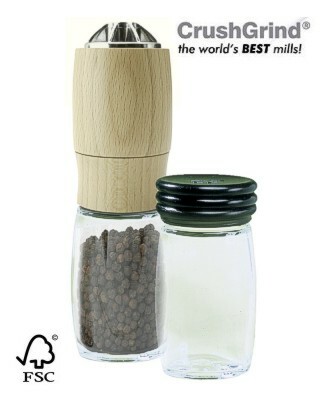 Easier and faster to use than a traditional pestle and mortar, this mill is capable of grinding whole dried herbs and spices and is fully adjustable from fine to coarse. The clever grinding unit screws onto the spice jar and can easily be removed when it needs refilling or changing for a different spice. Easily cleaned by grinding sea salt to remove any taste residue, extra jars are available for storing your favourite herbs and spices. Enjoy the vastly superior aroma and taste that only the milling of whole dried herbs and spices can provide. 16½ cm tall (approx 6½ inches). Arrives with a FREE filled spice jar.